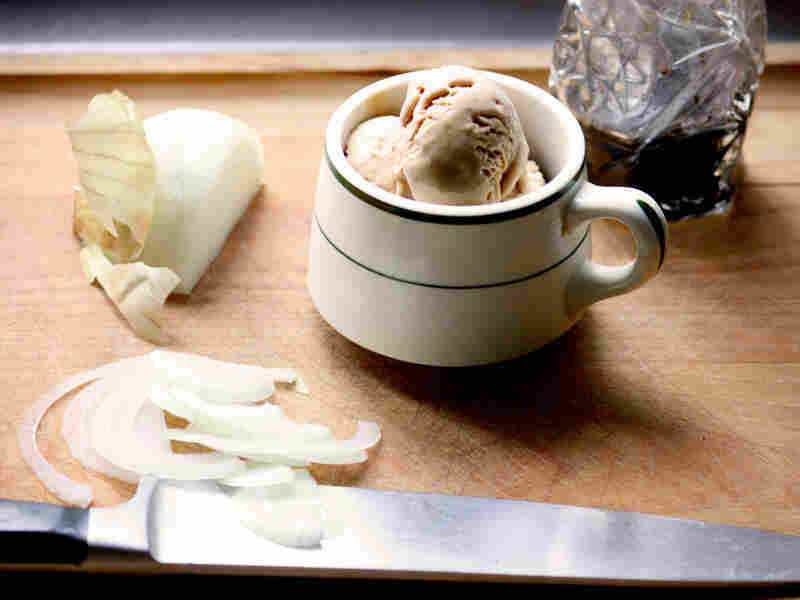 Red wine, onions, balsamic vinegar — they're strange, savory foils that veil the orange heart of this ice cream and render it mysterious. Perhaps the oddest thing about this recipe is that it comes out looking almost exactly like coffee ice cream. Pranksters, take note. The recipe is adapted from A Passion for Vegetables by Paul Gayler (Lyons Press, 2003). Put the onions in a pan of boiling water, simmer for 5 minutes, then drain. Repeat, then dry well on a kitchen towel. Melt the butter and 1/4 cup of the sugar gently in a heavy pan, add the onions and cook for 15 to 20 minutes, stirring occasionally, until caramelized to a deep brown color (take care — the color will turn quickly at the end and may burn if you don't watch it). Add the red wine, orange juice and zest and boil until reduced by half. Strain the mixture into a clean bowl and stir in the balsamic vinegar. Cool the ice cream quickly by standing the bowl in a larger bowl of iced water and stirring until cold (even better, pour the ice cream into a sturdy freezer bag and cool the bag in the iced water). Churn in an ice-cream maker until the mixture resembles semi-whipped cream, then freeze until firm.